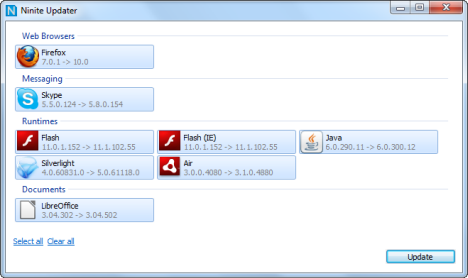 Ninite is a program that alerts you to other installed programs that are not at their latest version. This is important as when publishers become aware of a security flaw in their application - or indeed when they just want to enhance the performance or features available - they release a new version. If you don't have the latest version, your computer is exposed to whatever security flaws exist; you can just rely on your internet security program but why take the risk ? Ninite not only alerts you to updated versions but will install them for you. This is invaluable as it automatically declines the installation of linked malware that is so tricky to manually detect. It also selects the appropriate address size and language for you. It does not cause automatic restarts of the computer. Also it avoids the risk of being misled into installing similar looking programs from fake websites that maskerade as something useful but are really just fronts for virus injections; it does this by verifying digital signatures or hashes to confirm the source is the publishers official site. Once Ninte is installed you will see an 'N' icon in your Taskbar's notification area - you may have to click a chevron to expose all such icons. A red N indicates that updates are acailable, a green N shows that all is well. By double clicking the red N you are presented with a list of programs that could potentially be updated. e.g. 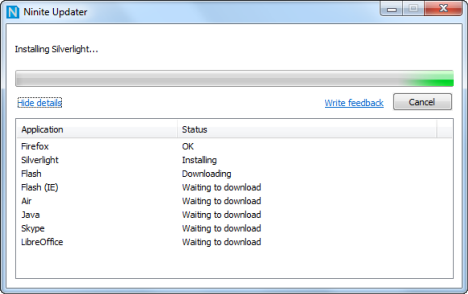 Each program will be queued to be downloaded then installed as the next program is downloading.